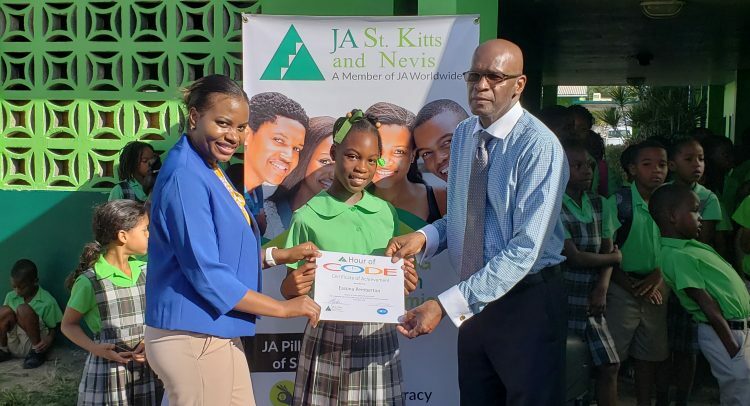 Basseterre, St. Kitts, Tuesday, 5th February, 2019, (MyVueNews.com) – Students who have successfully completed a special Hour of Code Competition, organized by the St. Kitts & Nevis Junior Achiever program, were highly commended for their successful participation and mastering of the training held during the latter part of 2018. The initiative was mainly funded by the Insurance Company of the West Indies, (ICWI), which is a Jamaican based entity, with a local branch in St. Kitts, located at Bird Rock Road. At a special ceremony held on Monday, 4th February, 2019, at the Tucker Clarke Primary School, in East Basseterre, over sixty (60), students received certificates of achievement. The certificates were jointly presented by the Permanent Secretary in the Ministry of Education, William Hodge, and the Business Development Officer, at the local ICWI branch, Nordia Dobbs. Dobbs, said the Insurance Company of the West Indies is honored to have been given the opportunity to partner with the Ministry of Education and the Junior Achievement Program of St. Kitts & Nevis. “For us, what makes the St. Kitts/Nevis Junior Achievement so unique is that it recognizes the need to expose all school children to computer science and to demystify coding and show that anyone can learn the basics of computer science,” stated the ICWI representative. Recognizing the value of the initiative, the plan is to add more schools at both the primary, and eventually at the secondary levels. However, as a pilot project, it was only the Tucker Clarke Primary and Dr. William Connor Primary that participated in the First Round. The program is to be introduced to other schools when the Second Round is launched in the near future. Dobbs said it is her company’s duty, as a good corporate citizen, to ensure the children of St. Kitts & Nevis and the Caribbean are not left behind in the technological advances of the modern world. “You have now been exposed to one of the most exciting and important fields that exists in the world today,” she stated. She told the students that for some of them, the brief introduction to coding, must have inspired them think of the vast possibilities, for a career path in the fields of technology and information. This is the industry of the future, she assured. “This, as it has been proven by new social media platforms like Facebook, Instagram, Twitter, Snap Chat and WhatsApp, is also the one industry that is best driven and led by young people the world over. Before your entry into the program, none of you had any knowledge of coding. But now that the exercise is over, you have become part of a small elite group of Kittitians and Nevisians with skills and competencies in coding,” continued the ICWI official. The presentation of certificates took place during the morning assembly of the Tucker Clarke, with all teachers, students and officials from the Ministry of Education, present. A similar ceremony will be held, once the program is completed at the Dr. William Connor Primary School.